In Fall 2017, the Chief Design Office (CDO) at USAA embarked on an initiative to cement design methods as fundamental and strategic inputs at the company. They commenced a series of education sessions for CDO team members to establish a baseline set of practices, and over the course of two quarters, more than 200 colleagues participated. Moreover, they observed that those who went through the training were applying what they learned in their everyday work. As the team continued to grow, the CDO recognized the need to streamline and improve the program. To accomplish this objective, a small, distributed project team explored how they could develop a new-hire design education program and reduce the amount of time it takes. Since we aren’t co-­located, we wanted to explore collaborating remotely and experiment to see what works. That's where MURAL comes into the equation. The USAA team is located across three offices in Texas – San Antonio, Austin, and Plano – and the project required them to collaborate regularly without traveling. While managing their other priorities from separate locations, the team needed to create an environment that would allow them to quickly apply iterative, visual problem-solving methods over the project lifecycle. Moreover, they understood that constant meetings and emails wouldn’t be an effective use of time. The team also needed to avoid common pitfalls that arise when gathering feedback from busy executives and stakeholders: falling behind schedule, facilitating several different conversations, and ending up misaligned. They sought a way to bring all feedback together to create a single source of truth, secure regular direction, and expose any potential constraints while staying on track. Knowing that getting all participants and stakeholders into the same room at every critical juncture of the project would be impossible, the group leveraged MURAL to work asynchronously and leverage the methods they were teaching to rest of the team in order to develop a new-hire design education program. They prepared value statements, created journey maps for all participants in the education process, mapped out a service blueprint, and incorporated busy stakeholders for feedback and approvals. It also served as their medium to efficiently gather necessary feedback from all stakeholders and drive decision-making in a healthy, asynchronous way. Crafting value statements collaboratively helps align whole teams on the member outcomes they intend to deliver. 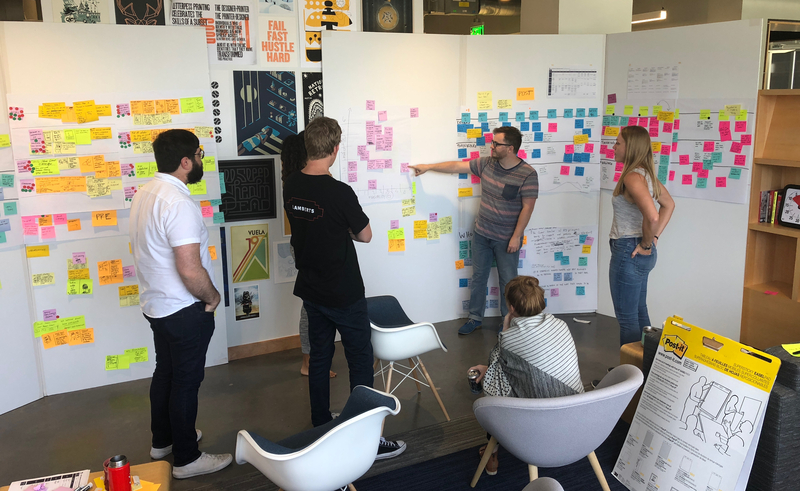 Because of their use of design thinking practices and remote collaboration with MURAL, USAA achieved a few powerful outcomes. First, they implemented a new-hire education program that initially went from 6 sessions over 7 weeks to 5 sessions in a single week, and now they are considering how to streamline that further into a 3-day session. 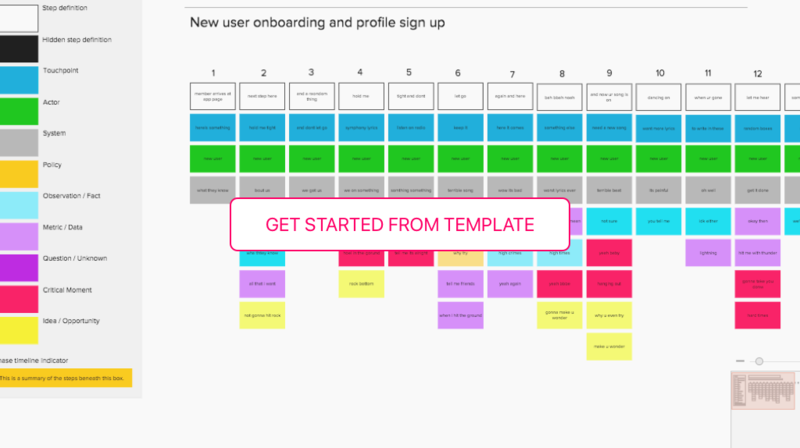 This reduction in the amount of time it takes to onboard a new team member in the Chief Design Office means that new colleagues can begin participating and adding value to the team and broader organization much more quickly. Second, USAA is effecting the change and business transformation within the CDO that they set out to achieve when they first implemented the design education program. They see a significant increase in colleagues applying the methodologies and practices in their daily work. Finally, their team now works and thinks differently, reducing habits that previously hindered them from working as collaboratively and effectively as possible. MURAL forces us out of our default state. We can think through multiple layers of an experience and plan all the details that need to happen. We can consider all the touchpoints in multiple dependent experiences. And we can determine how to actually support all those touchpoints. 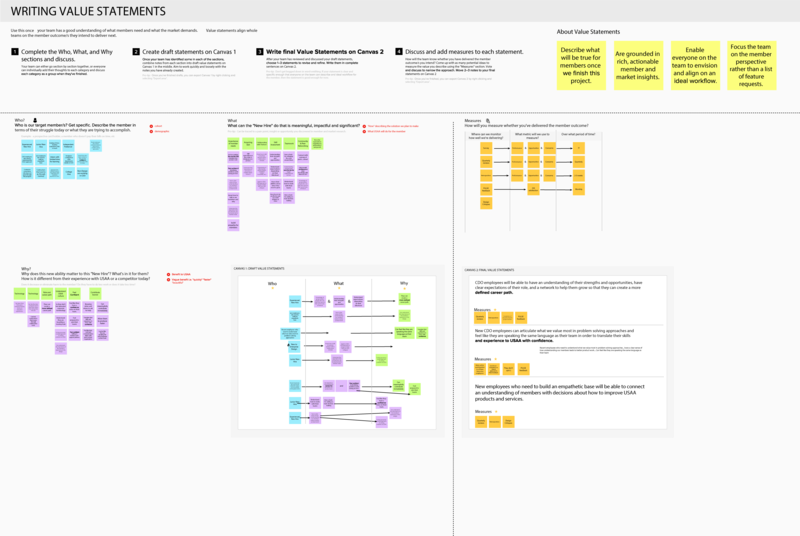 Creating blueprints - visual maps of the service and all of its touchpoints - lets teams visualize the service, gain a more holistic perspective and better understand all of the moving parts.